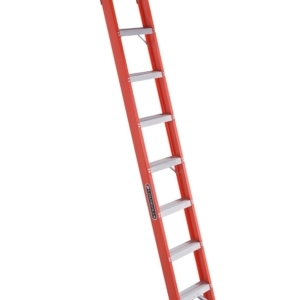 This Louisville 12 foot fiberglass shelf ladder has a load capacity of 300 lbs, rated ANSI Type IA. This ladder is designed so that steps are at level when the ladder is set at 18 degrees. This shelf ladder is equipped with a rubber bumper that extends 6-inches down the side rails to protect the landing surface and to provide stability, heavy-duty gusset bracing, angled aluminum slip-resistant rubber feet, double-rivet step construction, and angled serrated aluminum steps. 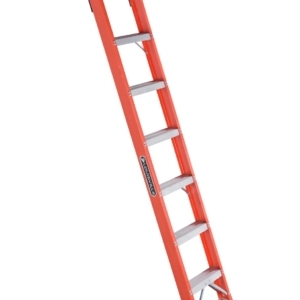 This ladder is ideal for getting to shelves with narrow aisles where standard ladders will not fit. 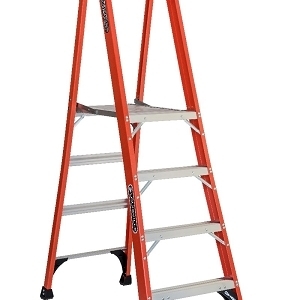 The Louisville FH1012 shelf ladder meets or exceeds the safety standards set by ANSI, CSA, and OSHA.